Google is Giving away 250,000 FREE business cards. 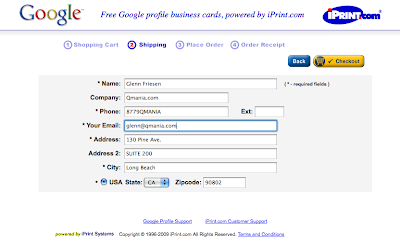 The first 10,000 people to order each receive 25 business cards highlighting their Google Profile. 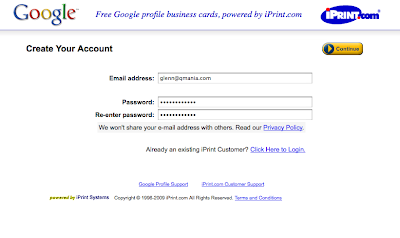 You have to have a Google Profile to be eligible for the free business cards. Of course, that's free too. 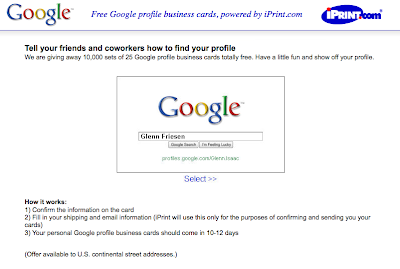 Even better than being eligible for these fun cards, creating this Google Profile will help you better control what people find when they search Google for your name. The process of ordering these cards is quick, easy, and a little fun. Ordering mine took about 3 minutes. If you beat my time, leave a comment :). Below are some screenshots of the flow. Thanks Google! This free business card giveaway is a fun way to introduce a new feature. :) Looking forward to receiving these in the mail (Free Shipping, as well - lol - they just keep on giving back!). Get yours now by heading to http://www.google.com/profiles/me/bizcards.